According to the National Cancer Institute, the easiest and most cost-effective way to decrease your risk for cancer is by eating better. Although most people know what to avoid in order to stay healthy—mainly processed foods, foods high in saturated fats, and those packed with sugar (especially fructose)—knowing which foods pack the most nutritional punch can be less clear. Most experts agree that a diet rich in cancer-fighting ingredients is largely plant-based. The general rule of thumb when setting your plate is two parts plants to one part protein or whole grain. So while all fruits and veggies are good for you, there are certain foods that are just better. Here are five of those cancer-fighting foods everyone should add to their diet. Dark green, leafy vegetables are overflowing with this B-complex vitamin. Sufficient levels of folate protect against DNA mutations, which in turn protects us against cancer. However, even if you don’t eat that many dark green vegetables, you can still get folate in its synthetic form—folic acid—as many manufacturers of cereals, pastas, and breads fortify their products with it. Berries contain particularly powerful antioxidants that fight against the naturally occurring process of oxidation, which creates harmful molecules known as free radicals that can damage cells. 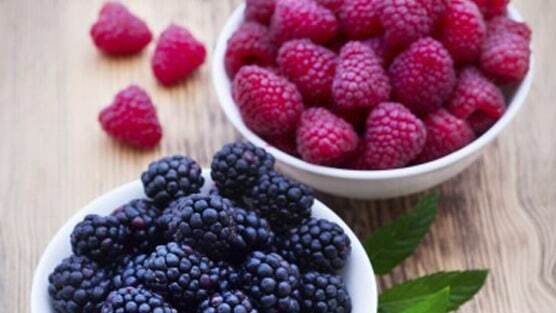 All berries are packed with antioxidants, but black raspberries in particular contain very high concentrations of cancer-fighting compounds called anthocyanins, which may help keep cancers from growing or spreading. Like many plant-based foods, green tea contains flavonoids, which are known for their antioxidant effects. As mentioned above, antioxidants protect you from the free radicals that can damage cell DNA. One flavonoid in particular, kaempferol, found in tea, has shown protective effects against cancer. Members of the cabbage family like cauliflower, broccoli, and Brussels sprouts can help you fight off cancer. An antioxidant called sulforaphane is released when you chew these veggies, and sulforaphane has been documented as having a protective effect on body cells. Research has revealed ginger’s ability to kill cancer cells in two ways. In both, ginger works directly on cancer cells to cause apoptosis and autophagy. In apoptosis, the cancer cells “commit suicide” without harming surrounding cells. In autophagy, the harmful cells are duped into eating themselves. Ginger can be used in soups, sauces, marinades, or as an addition to your favorite drink.